The Little Guide to Pizzas reveals the endless possibilities of pizza. With over 95 recipes, it shows you how to make traditional, best-loved and highly inventive versions of one of the most popular meals ever known. From the doughs and sauces to the endless toppings you can choose, pizza caters to a wide variety of tastes. Find out new ways to serve an old favorite and delight your guests! 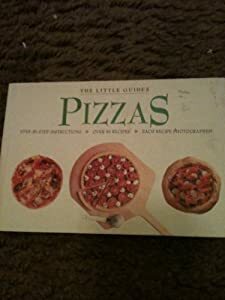 This stunning book contains over 400 full-color photographs–including a picture of each of the delicious pizzas you can create. One of the world’s most popular foods, pizza is also one of the most versatile. Discover in this book the vast range of toppings you acn choose from, and be isoired to create your own! ? Over 95 pizza recipes, including focaccia ? Delicious sauces and doughs ? Vegetarian, meat and seafood toppings ? Creative guide to pizzas from around the world! Standard cookbook for ‘The Little Guides”, lots of pictures, detailed instructions, ingredients could be out of budget for some households. A great big plus is they encourage using fresh, healthy ingredients for the pizzas, like tomatoes, garlic vegetables, meats, seafoods and so on. The big negative is the price of ingredients may inhibit some from trying out new recipes. The recipes themselves are not difficult to follow, from making the myriad of doughs (white flour, wheat, foccacia, etc), to preparing the toppings (beef, sausage, octopus, haloumi, swiss, american, cheddar, mozzarella, etc). Typically, the base ingredients are readily available in most generic grocery stores, some seafoods and exotic meats (like those from Italy and around the Mediterranean) may not be available in all markets or too pricey. Basic, feel-good foods from Fog City Press, another winning little cookbook. I would give 4 stars.